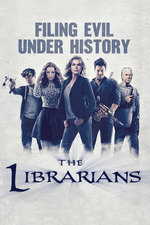 Flynn leads the Librarians on a mission to rescue a kidnapped Charlene, but the team falls into a subterranean trap packed with menacing Egyptian werewolves overseen by old nemesis Apep. I fell for their trick of Charlene being dead, and was so bummed out, very glad they didn't actually kill her off. And I'm enjoying the Stone/Ezekiel comedy this season - it's no Eliot/Hardison, but it is cute. Is John Rogers no longer actively involved with the show? He's remarkably silent about it and his only twitter acknowledgement of Sunday's episode was retweeting one of the stars. I was worried about Charlene, and am still worried about Eve.